Hoot-n-shoot finally got a deer! 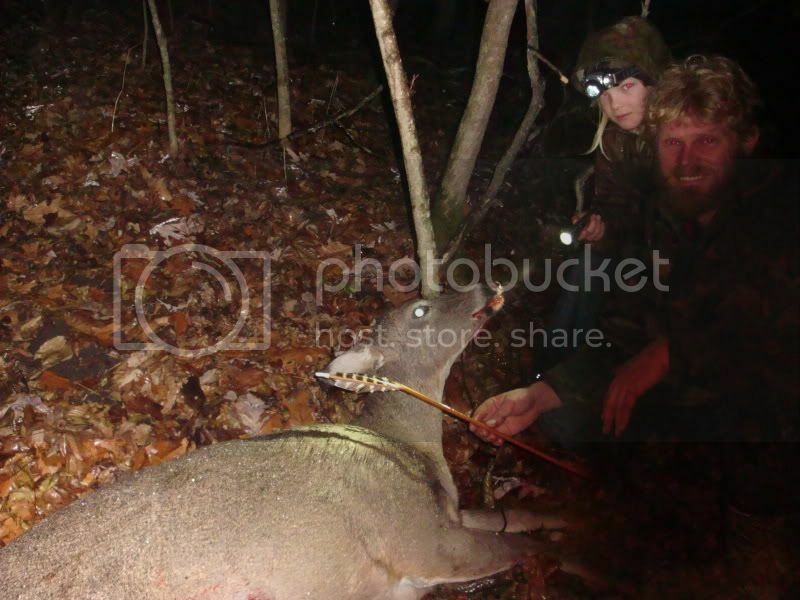 I shot a doe last evening at dusk. Finally all the hard work pays off! Pictures are a little weak, it was raining. I have been flintknapping for twelve years with the intention of hunting with my flint points. Four years ago I connected with Little Tree Bows (Brad M) and he taught me to make self bows in trade for flintknapping lessons. I have been hunting deer with my selfbow for three seasons now, with little luck and lots of broken and lost arrows. Only one real shot that I missed two years ago. It is amazing what so much time in the woods will teach you about wildlife behavior and patterns. Last evening three of um came in and I shot the first big doe while she was walking. Quartering away I shot up at a good angle. I was set up ready for the shot when she came into my view at a angle of about three o'clock. I adjusted my feet a tad and stopped. I did not want her to see my movement. She took a few more steps until she was at angle of about 6 o'clock, That's 180 degrees from my foot stance. I was almost all twisted up and off balance. I let er rip and heard and saw the arrow zip at her at 15 yards. Hit her back from the sweet spot but since she was quartering away and I was shooting up at her my arrow went into both lungs. I had 30 minutes to hunt be for I had to pick up my wife down town. She just got back from Caly (big work trip). I hit the woods and when I had 4 min left I hear the deer. So after the shot. I crest the rim of the gully and see two deer wht flags running away at 60 yds. I turned around and headed for town. Got Lisa, came home grabbed the kids and hit the woods. Right where I saw the two is where she was. She carried my arrow 60 yards and gave it up to the flint flinger! The point scooted in between two ribs hit both lungs and pushed a very small hole threw the opposite side of body cavity, but not puncturing the skin. Flint tip was unharmed and still razor sharp. Amazing the power of stone! Just got her skuned, and were having tenderloin for supper tonight. one happy hoot at you!!!!!!!! Teach, and be taught well. Re: Hoot-n-shoot finally got a deer! Awesome Bro! Way to stick with it. That's cool, congrats! Looks like it turned into a shoot and hoot! Congratulations!! The harder the journey, the better the reward. Congrats! I want to try that with a stone point and my selfbow some day. I did take my selfbow to africa in June and was able to take a warthog with it. It was a blast because my PH kept telling me he did not think I could do it with that bow. Very nice, great to see the kids involved.